Home LIFA News LIFA highly recommends this trip. We went last year and it was a once in a lifetime experience. BARRIERS AND FENCES WORK TO SECURE NATIONAL SOVEREIGNTY! You will meet Israeli, Dr. Dany Tirza, “the man who orchestrated Israel’s barriers on the West Bank and Sinai Peninsula.” (We prefer to call it by it’s correct name, Judea and Samaria) “Dany Tirza was in charge of strategic planning from 1994 to 2007 as a colonel in the Israel Defense Forces.” Read more about Dr. Tirza here. 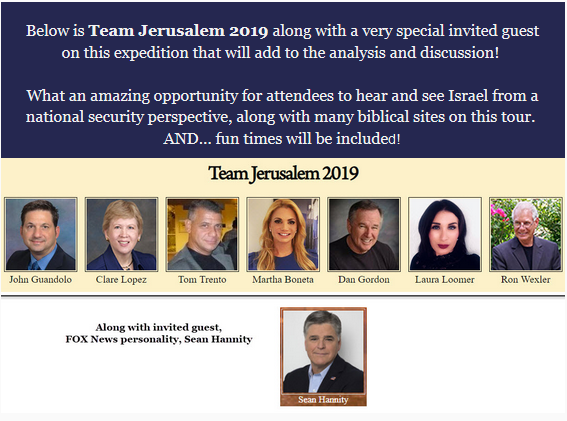 This tour of Israel will also present you with deep analysis and understanding of the threats to Israel, which also impact America. Meet Activists and National Security Analysts that will present facts about the threats and hear what they recommend MUST be done! Also, Do NOT miss an event planned at the Jordan river, that will be a moment in time that you will NEVER forget! Hear the emotional story behind the 2018 Jordan River baptism that Gold Star parents, Karen & Billy Vaughn experienced in last years tour. Experience the 2019 event planned that will commemorate their son and hero, Aaron Carson Vaughn. GET SIGNED UP AND REGISTER TODAY! HOTEL SPACE IS LIMITED AND WILL BE CLOSING SOON!